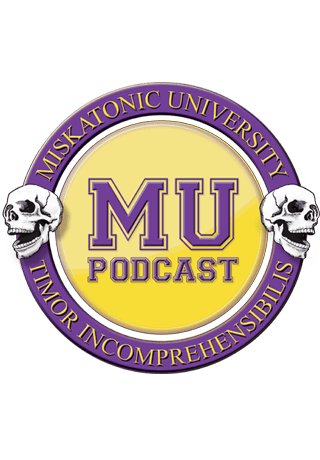 This episode, we’re talking about the Tillinghast Resonator and other ideas that spawn From Beyond. This episode was recorded on July 19, 2018. The Campus Crier is Miskatonic U’s student paper. Here’s where we go through Mythos related news and feedback to the podcast. This episode was recorded on July 19, 2018. Delta Green: The Labyrinth – Delta Green co-creator John Tynes presents a sourcebook of threats, allies, and mysteries to deepen the terrors of your campaign. Over the Edge – Return to the island of Al Amarja in this new edition of Jonathan Tweet’s freeform roleplaying game of paranormal chaos. Tails of Valor for Cathulhu has funded! It wrapped up at $16,380 with 320 backers (a the time of recording it was just past the $12,500 goal with 228 backers), and unlocked six stretch goals, including extra interior art and fiction stories, sinister seeds, and bookmarks. Also, Sentinel Hill Press did a Q&A with Oscar about the project, mostly on the Kingsport Council feline investigator group and Grey in the Dark”, a scenario also set in Kingsport. You can check that out in the show notes! Jon was a guest on Spellburn! Spellburn is a podcast that focuses on the Dungeon Crawl Classics RPG, and episode 70 is all about using the Cthulhu Mythos in your DCC fantasy game. Jon talked about his Cthulhu Mythos inspired DCC adventures and the upcoming Cthulhu Alphabet book coming soon from Goodman Games. Amazon Studios has greenlit, “Tales from the Loop,” an hour-long science-fiction series executive produced by “War for Planet of the Apes” director Matt Reeves. The series is based on the famous artwork of Simon Stålenhag. A co-production with Fox 21 Television Studios, the eight-episode series will be helmed by executive producer Nathaniel Halpern, with Mark Romanek directing the pilot episode. “Tales from the Loop” explores the town and people who live above “The Loop,” a machine built to unlock and explore the mysteries of the universe — making things possible that were previously relegated only to science fiction. In this fantastical, mysterious town, poignant human tales are told that bare universal emotional experiences while drawing on the intrigue of genre storytelling. Punktown is out in PDF! Originally a Kickstarter from Miskatonic River Press in 2012, various development problems (and the closure of MRP) meant that the Punktown setting book, based on the works of Jeffrey Thomas, has now been completed and made available through Chronicle City (@AngusA). The print edition of Punktown is still in process. MetaArcade have launched the next chapter in the Investigations in Lovecraft Country series of linked adventures for Cthulhu Chronicles – an original scenario called The Good Professor. It builds on everything you have experienced so far in Cthulhu Chronicles; tensions are rising, and your decision-making skills will be put to the test. Like all others, this scenario is available for 20 tickets, or you can play it for free using one of your trials. The Good Professor will be followed by 3 more scenarios, as the campaign arc reaches its epic conclusion. Are you ready for the challenge? Check out Cthulhu Chronicles on the Apple App Store today. MetaArcade have also confirmed an Android version of Cthulhu Chronicles is their highest priority post-launch. More details at the MetaArcade Dev Blog. And a big thank you goes out to MAX this time. Thank you so much for the editing MAX! Now we’re heading back to the “Listening Room” of Orne Library. This episode, Mr. Tyler is turning his chair backwards and getting a bit more serious about a personal matter. We talk about the original story, which you can read here. Infrared sight experiments in WWII.